we will be offering paid tastings with commemorative cups. We have a small charege for tasting sake. A set of three glasses is about 500yen. It's best to drink cold. It's good to drink hot, warm* or cold. It's not dry and 14% alcohol. Please shake well before pouring. *Plese note, we can't serve warm or hot sake. Only cold and room temperature. ** BY stands for the year it was brewed. 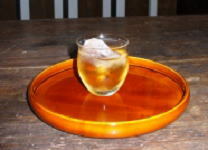 Our premium Umeshu is made by steeping fully-ripe highest-quality Minabe Nanko-Ume (plum) in our aged sake,「Genshu Hidamasamune 2008BY」with rock sugar. One shot glass is 330yen.